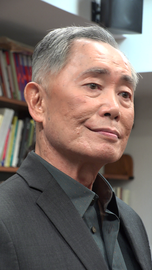 George Hosato Takei is a japanese-American actor, director, author, and activist. Takei is best known for his role as Hikaru Sulu, helmsman of the USS Enterprise in the television series Star Trek. He also portrayed the character in six Star Trek feature films and one episode of Star Trek: Voyager. Takei's involvement in social media has brought him new fame. As of February 2017 his Facebook page has over 10 million likes since he joined in 2011, and he frequently shares photos with original humorous commentary.